The Aunt Sukey's Choice quilt block pattern can fit into several categories. It can be an easy block, because it is made up of commonly used quilt patches, such as the half square triangle. Aunt Sukey's Choice can also be considered an intermediate skill level because of the larger number of pieces required to make the quilt block. By taking your time and paying attention to accuracy of your seam allowance, you will find this an enjoyable block to create. Two very different quilts are shown here. 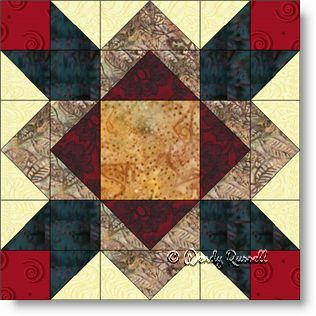 By setting the quilt blocks on point and adding additional large triangles, you achieve a totally different look than by using the common, straight set for the quilt blocks.